Instant Imprints Cranberry Township, PA | Custom T-Shirts, Embroidery, Signs and More! At Instant Imprints Cranberry in Cranberry Twp, Pennsylvania, our customers come to us when they want to be more visible to their customers. We create that visibility five different ways: Branded Apparel (embroidery), Signs & Banners, Promotional Products, Custom T-Shirts and Print Services. I greatly appreciated that you accommodated to get my T-shirts ready with a very short notice. Everything was handled very professionally - ordering process, payment process, payment notification etc... Thank you very much!! Is your local brand looking to step up its visibility in big ways? Then look no further than Instant Imprints, right here in the Township of Cranberry! We have the custom t-shirts, printing services, promotional products, custom banners and branded embroidery items that can take your brand awareness to new heights. We pride ourselves in getting your job delivered on time and done right. When you need the quality of an industry leader combined with the local touch of a Cranberry Image Expert, Instant Imprints is your go-to print shop. If you’re in need of promotional goods of any kind, just ask your smartphone, “Where’s the best print shop near me?” and you’ll be sure to find Instant Imprints in Cranberry! We have the latest in production techniques along with a printing expertise like no other. Our Image Experts are happy to answer any questions you may have, and your promotional goods are produced all under one roof, right here in Cranberry Township. When you need custom t-shirts done right, come on by your Cranberry Instant Imprints. Virtually every major brand has a custom tee of their own, and that’s because custom t-shirts provide a serious promotional punch. Wherever your shirt is worn, your brand image will be spread from sea to shining sea. If you’re looking to promote an upcoming event, memorialize a past one or push your brand as a whole, Instant Imprints has the expertise to give your promotional campaign the boost it needs. In addition, our custom embroidery service can customize most any garment. 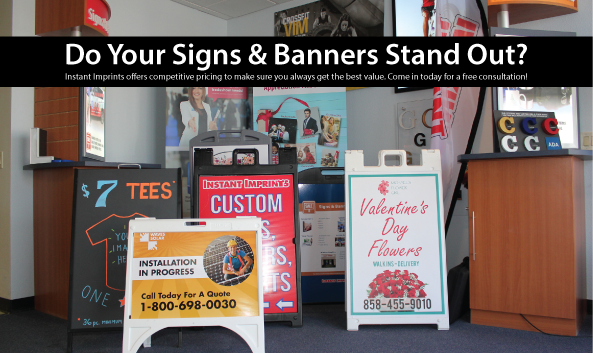 Brands and businesses of all sizes have known the promotional power of custom signs and banners since the early days of marketing. They’re one of the best ways to establish your businesses in the local community, whether it’s through a durable banner or a storefront sign. When you need to visually dress up your storefront, our Image Experts can help you pick the right combinations of colors, fonts and other design options to provide you with a superior business sign. No matter what your promotional goals are, our Cranberry Image Experts are happy to help you achieve them. Stop by our Cranberry showroom, give us a call at (724) 776-0360 or request a quote online today!